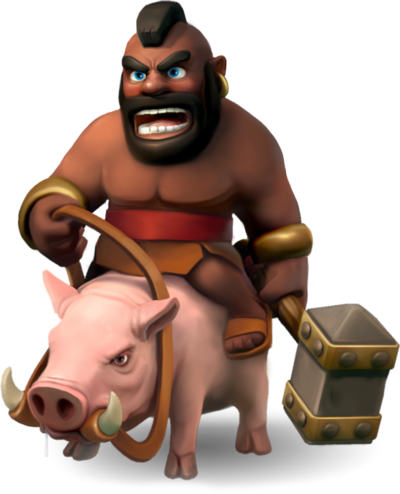 The Hog Rider is one of many Dark Troops in the Clash of Clans game. Having tamed the fierce leaping hog, the Hog Rider punishes those who hide behind their puny walls! Fueled by Dark Elixir, these warriors have never known defeat! 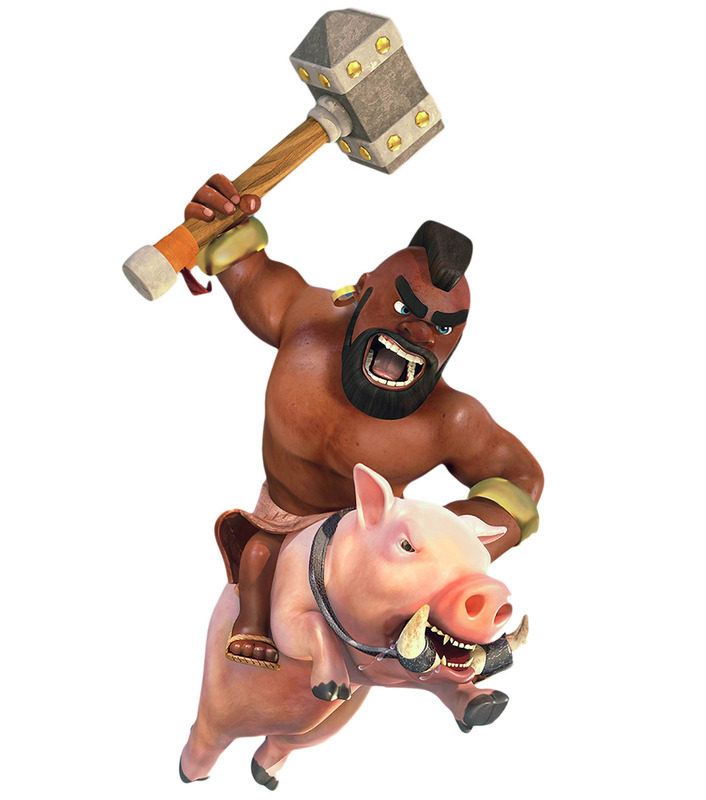 The Hog Rider is a rugged, dark-skinned man with a mohawk riding a large hog. He is bare-chested, wearing only a brown leather loincloth, a red belt and a pair of leather sandals. He has two large golden wristbands and a gold earring. His weapon of choice is a large warhammer. His mount is a large boar/hog, about half its rider’s height; the Hog Rider holds a brown leather bridle which is looped around the boar’s tusks. Because of his mount, the Hog Rider can jump over Walls, giving the user a great advantage over the enemy base. Although he has high damage per second and moderate hit points, he only takes 2 minutes to train. Hog Riders prioritize Defensive Structures above all other targets, and will bypass all other types of enemy Buildings and Troops while any Defenses remain on the battlefield. This is true even if they are under attack by enemy Clan Castle troops, Heroes or Skeleton Trap skeletons. Note that like all Troops that prioritize Defenses, Hog Riders do not consider the Clan Castle to be a Defenses regardless of whether or not it contains enemy Troops. Once all Defenses are destroyed, Hog Riders become like any other Troops with no preferred target; they will attack the nearest building to them regardless of type, and will turn and attack enemy units if they become aware of any nearby. Description of common tactics of usage a Hog Rider on a battlefield is Here. Initially, the Hog Rider has a black Mohawk and beard, and a gold earring in his right ear. He has two heavy golden wristbands, a red belt, and a brown loincloth. The Hog Rider’s hammer has two brass bands. At level 3, the Hog Rider’s hammer increases in size and turns black. The brass bands on the hammer’s head disappear, and the hammer head goes further down onto the stick, creating a button looking object on the top of the hammer head. At level 5 his mohawk turns from black to orange, making it similar to that of a level 5 Goblin. 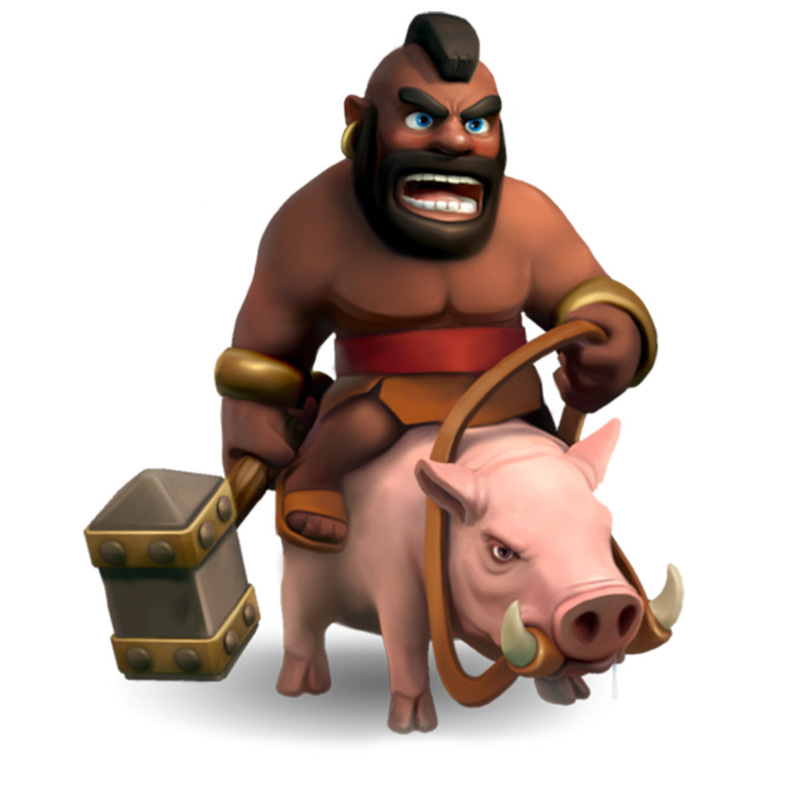 Though the Hog Rider appears in many ways to be a mounted barbarian, unlike the Barbarian the Hog Rider’s teeth appear to be in perfect condition. When there are no Defenses left and the Hog Riders are attacking a building, they do not attack Heroes nor Troops until they have destroyed the Building. In the Clan Wars commercial, if you look carefully, you can see a gold tooth. He has more than a passing resemblance to “Mr. T”, an American actor. He was added in the 12 Mar 2013 update. On 27 Aug 2013 his training time was reduced from 5 minutes to 2, and he was given a preferred target (defenses). You can have a maximum of 48 Hog Riders at one time in a complete set of fully upgraded Army Camps. This number increases to 55 if you include the 7 that can fit into a fully upgraded Clan Castle. Hog Riders have the most legs of any Troop with a total of six (including man and hog). 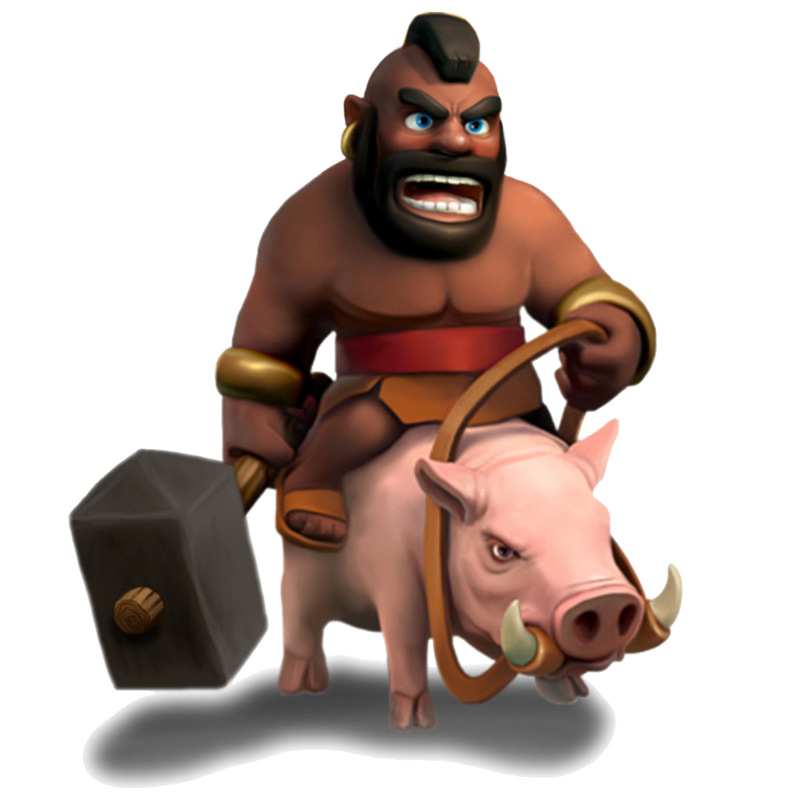 The phrase,”Did somebody say Hog Rider?” comes from the Clash of Clans TV commercial.